PC Instrumentation Expansion Chassis - GTXI-700 | Marvin Test Solutions, Inc. 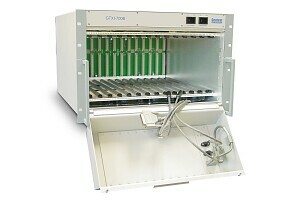 The GTXI-700 is the first generation of the GTXI enclosure series. It can be used as a PC expansion chassis for 13 ISA cards or as a stand-alone unit using the GTPC-7586 (10 usable slots). The GTXI-700 provides the same mechanical and electrical advantages as the GT7700 but accommodates ISA cards only. The board is supplied GTXI configuration utility. On-Line help file and PDF User's Guide provides documentation that includes instructions for installing and using the chassis.